Turkmens are one of the main Turkic ethnic group in Central Asia, mainly in Turkmenistan, ethnic minorities in Afghanistan and Iran. 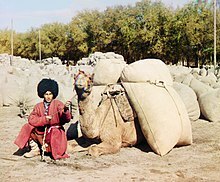 They speak Turkmen language of the Turkic languages family. This page was last changed on 29 March 2018, at 05:19.